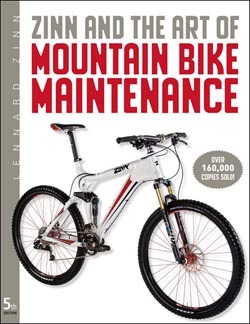 Zinn & the Art of Mountain Bike Maintenance is the world's best-selling book on mountain bike care and repair for good reason: it covers every procedure to repair, maintain, tune, or upgrade a mountain bike in an easy-to-follow, step-by-step format. Weighing in at a whopping 464 pages with 600 illustrations, this new fifth edition offers total coverage of all the newest mountain bike tech without neglecting tried-and-true components. Zinn & the Art of Mountain Bike Maintenance, 5th Ed. is now available in bookstores, bike shops, and online. Readers can preview the book's table of contents and its entire index at VeloPress.com/Zinn. With Zinn's book, anyone can properly maintain, tune, fix, or upgrade a mountain bike to ensure years of trouble-free riding. Newcomers and experienced mechanics alike will benefit from complete instructions for basic and advanced repairs, exploded views of how parts go together, time-saving tips, and smart recommendations from Lennard Zinn, America's leading expert on bikes. Zinn & the Art of Mountain Bike Maintenance, 5th Ed. Paperback. 2-color interior. Over 600 illustrations. Lennard Zinn was a member of the U.S. national racing team and has been riding and fixing bikes for nearly 50 years. A professional frame builder and bike designer, Lennard is also the technical writer for VeloNews magazine and Singletrack.com and hosts the popular Q&A column on VeloNews.com. His other books include Zinn & the Art of Road Bike Maintenance, Zinn & the Art of Triathlon Bikes, Zinn's Cycling Primer, The Mountain Bike Performance Handbook, and The Mountain Bike Owner's Manual. He lives and works in Boulder, Colorado. VeloPress is an endurance sports and fitness publisher with books on cycling, triathlon, running, nutrition and diet, and the histories and personalities of our sports. VeloPress is the book-publishing division of Competitor Group, Inc., publisher of VeloNews magazine and Singletrack.com.